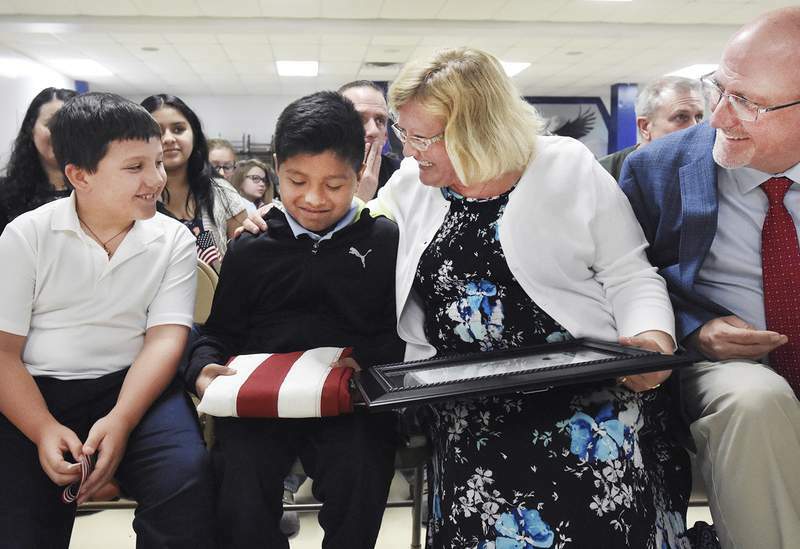 Cathie Rowand | The Journal Gazette St. Jude Catholic School student Uriel Cochran admires the flag he received from U.S. Sen. Todd Young at a naturalization ceremony Friday as friend Henry Tippmann and Uriel's parents, Don and Mindy Cochran, look on. 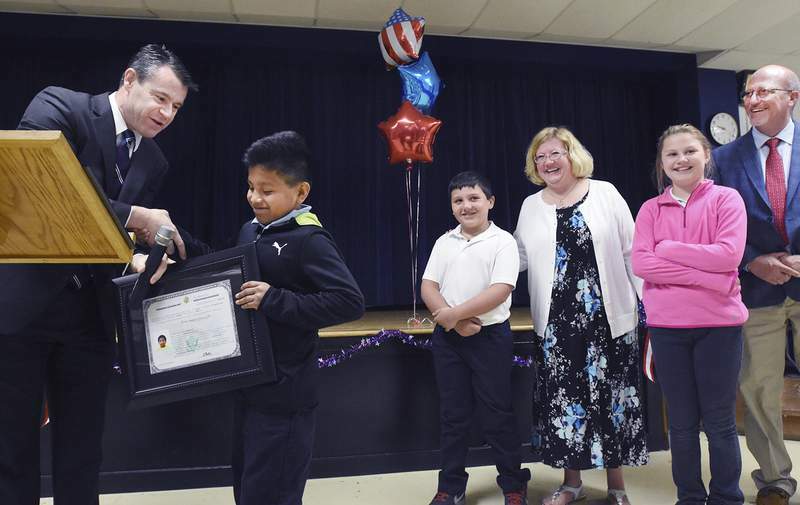 Cathie Rowand | The Journal Gazette U.S. Sen. Todd Young presents a certificate of American citizenship to St. Jude Catholic School fourth-grader Uriel Cochran, a native of Mexico. “It feels good to have somebody by your side when you want them to, so they can be supportive of you,” Uriel told news media after the event. “I'm glad everybody was excited for me,” he said. “I'm excited that today I can call you my fellow American and my fellow Hoosier,” the senator told Uriel, who also is known as Uri. 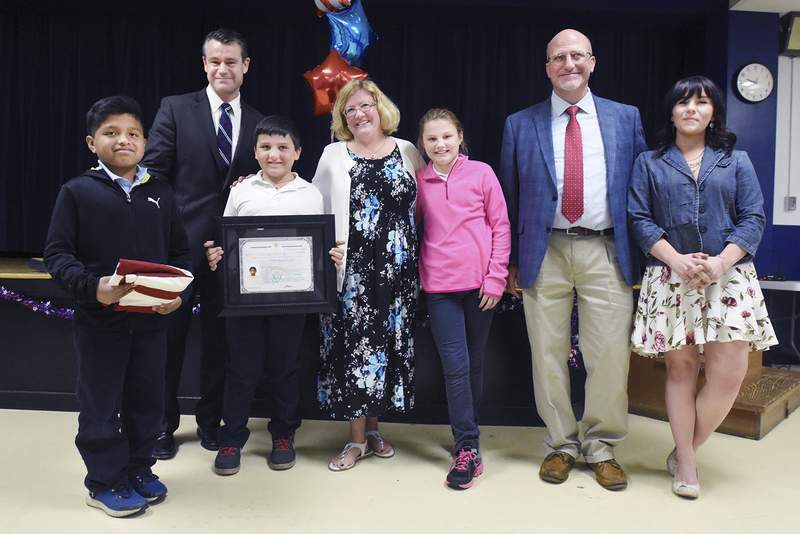 “You are one special young man, and we are so fortunate to have you here at St. Jude School,” Gehl told him. “I taught him everything I know,” Henry quipped after the whole thing was finished and the kids could be kids again.